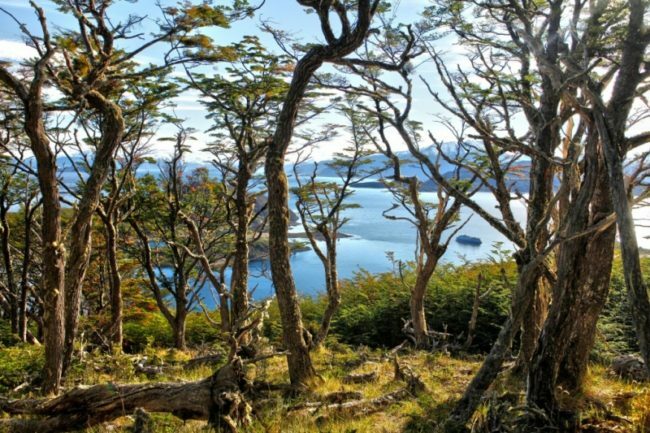 The Route of Charles Darwin – The Great Canadian Travel Co.
Visit Patagonia and explore the old stomping grounds of world famous scientist Charles Darwin. Renowned experts will be on board to highlight Darwin’s sailing route, landing points and his scientific discoveries. Check in at the Australis pier at 1385 O’Higgins Street (Arturo Prat Port) in Punta Arenas between 13:00 and 17:00 (1-5 PM) on the day of your cruise departure. Board the MV Stella Australis at 18:00 (6 PM). After a welcoming cocktail reception hosted by the captain and his crew, the ship departs for one of the remotest corners of planet Earth. During the night we cross the Strait of Magellan and enter the labyrinth of channels that define the southern extreme of Patagonian. The twinkling lights of Punta Arenas gradually fade into the distance as we enter the Whiteside Canal between Darwin Island and Isla Grande de Tierra del Fuego. 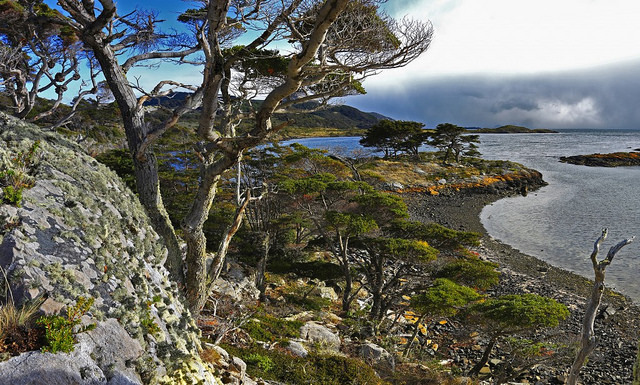 By dawn Stella Australis is sailing up Admiralty Sound (Seno Almirantazgo), a spectacular offshoot of the Strait of Magellan that stretches nearly halfway across Tierra del Fuego. The snow-capped peaks of Karukinka Natural Park stretch along the north side of the sound, while the south shore is defined by the deep fjords and broad bays of Alberto de Agostini National Park. We go ashore at Ainsworth Bay, which harbors copious bird life and a colony of southern elephant seals which can sometimes be spotted from the Zodiacs. Two guided excursions are available: one is along the edge of a stream, peat bog and beaver habitat to a waterfall-and-moss-covered rock face tucked deep inside a pristine sub-polar forest; the other is a more strenuous hike along the crest of a glacial moraine. Both afford views of Marinelli Glacier and the Darwin Mountains. Leaving Ainsworth Bay behind, we sail west along the sound to the Tucker Islets. After lunch, we board the Zodiacs again for a close-up view of the Magellan penguins that inhabit the tiny islands. More than 4,000 penguins use Tucker as a place to nest, give birth and nurture their chicks. Many other bird species also frequent the area including king and rock cormorants, oyster catchers, Chilean skuas, kelp geese, dolphin gulls, eagles and even the occasional Andean condor. In September and April — when the penguins live elsewhere — this excursion is replaced by a short walk to a glacier at nearby Brookes Bay. Back onboard Stella Australis, we continue east along the Beagle Channel through an area called Glacier Alley*. Living up to its name, the passage features a number of impressive tidewater glaciers flowing down from the Darwin Mountains and Darwin Ice Sheet on the north shore. Most of them named after European countries — Holland, Italy, Germany, Spain and France. During the early morning we sail down the narrow Murray Channel between Navarino and Hoste islands and drop anchor at historic Wulaia Bay. 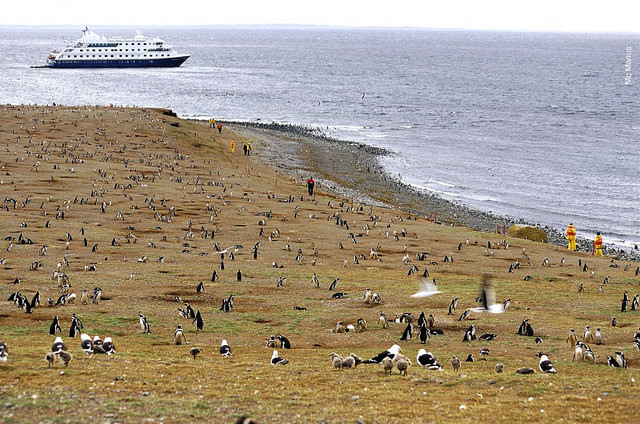 Australis is the only cruise ship company with permission from Chilean authorities to navigate the Murray Channel to Cape Horn, and because of its exclusive concession the only travel company allowed to land passengers at Wulaia Bay. Wulaia Bay is one of the few places in the archipelago where the human history is just as compelling as the natural environment. Originally the site of one of the region’s largest Yámana aboriginal settlements, the bay was described by Charles Darwin and sketched by Captain FitzRoy in the 1830s during their voyages on the HMS Beagle. This area is also renowned for the mesmerizing beauty and dramatic geography. After a visit to the small Australis sponsored museum in the old radio station — which is especially strong on the Yámana people and European missionaries in the area — passengers have a choice of three hikes (of increasing degrees of difficulty) that ascend the heavily wooden mountain behind the bay. On all of these you will be strolling through an enchanted Magellan forest of lengas, coigües, canelos, Ñirres ferns, and other endemic fauna to reach a panoramic viewpoint overlooking the bay. Before leaving Wulaia Bay, drop something into the wooden mail barrel inside the museum – letters or postcards meant to be hand delivered by future travellers – an ancient mariner tradition revived by Australis. In the afternoon we cruise across Nassau Bay into the remote archipelago that includes Cape Horn National Park. Weather and sea conditions permitting, we shall go ashore on the windswept island that harbours legendary Cape Horn (Cabo de Hornos). Discovered in 1616 by a Dutch maritime expedition — and named after the town of Hoorn in West Friesland — Cape Horn is a sheer 425-meter (1,394-foot) high rocky promontory overlooking the turbulent waters of the Drake Passage. For many years it was the only navigation route between the Pacific and Atlantic, and was often referred to as the “End of the Earth.” The park was declared a World Biosphere Reserve by UNESCO in 2005. The Chilean navy maintains a permanent lighthouse on the island, staffed by a light keeper and his family, as well as the tiny Stella Maris Chapel and modern Cape Horn Monument. The following morning we sail into Argentine waters and dock in Ushuaia, the world’s southernmost city. Disembarkation is scheduled at 8 AM. You have almost a full day to explore Ushuaia, founded in 1884 and one of the original points of contact between the indigenous Yámana and European cultures. Its name derives from the Yámana word for ‘penetrating bay’ and it’s surrounded by the southernmost Andes peaks. With around 65,000 inhabitants, Ushuaia is the second largest city in Tierra del Fuego (after Rio Grande). Among its highlights is the Prison at the End of the World, a former penitentiary that is now a maritime museum, Antarctic collection and memorial to those once incarcerated there. The city is also good for shopping (especially locally made chocolate) or hanging out in its many cafes. Passengers are required to re-board Stella Australis at 17:30 (5:30 PM). After a welcoming cocktail reception hosted by the captain and his crew, the ship departs for more adventures in Tierra del Fuego. During the night we traverse the Beagle Channel, cross back into Chilean territorial waters, and turn into the narrow Murray Channel between Navarino and Hoste islands. By early morning, Stella Australis is once again cruising across Nassau Bay to Cape Horn. Our itinerary day repeats the shore landings and other activities from Day 4. However, second landings at some of the more iconic spots along the route can sometimes be more rewarding than the first time around and give you more time to explore each place in depth. At Cape Horn you have a second chance to visit the Stella Maris Chapel, chat with the lighthouse keeper and his family, or photograph the unusual sub-polar flora that covers the heights. At Wulaia Bay, explore the museum in much more depth, strike out on a longer walk than last time, bird watch along the shore, or sort through the mail barrel to see if anyone lives close to your own home. This second approach also increases your chances of landing on Cape Horn Island. After nightfall we re-enter the Beagle Channel and sail westward along the southern edge of Tierra del Fuego into a watery wonderland protected within the confines of Alberto de Agostini National Park. By morning we are entering Pia Fjord again and another chance to hike beside its famous glacier. Making our way further west along the Beagle Channel, we enter another long fjord and drop anchor near Garibaldi Glacier for another shore excursion. Garibaldi is one of only three glaciers in Patagonia gaining mass rather than staying the same or slowly shrinking. This time we hike through virgin Magellanic forest to a glacial waterfall, a towering wall of ferns and moss, and spectacular viewpoints looking down on the glacier and fjord. The walk is demanding — very steep, negligible trail, rough footing — and not for everyone. For those who choose to stay on-board, our captain will point the bow towards the beautiful sky blue Garibaldi Glacier so everyone can enjoy the panoramic view from the upper decks. Early in the morning we will sail through Cockburn Channel and enter Agostini Sound, where it’s possible to see glaciers that descend from the middle of the Darwin Mountain Range — some of them reaching the water. We will disembark and go for an easy walk around a lagoon formed by the melting of the Águila Glacier, eventually reaching a spot right in front of that glacier with stunning views. In the afternoon, we will approach the Condor Glacier via Zodiac — and hopefully see some of the abundant Andean Condors in the area. In September and April — when the penguins dwell elsewhere — this excursion is replaced by a ride aboard Zodiacs to Marta Island to observe South American sea lions. After a short cruise south along the strait, disembarkation at Punta Arenas is scheduled for around 11:30 AM. 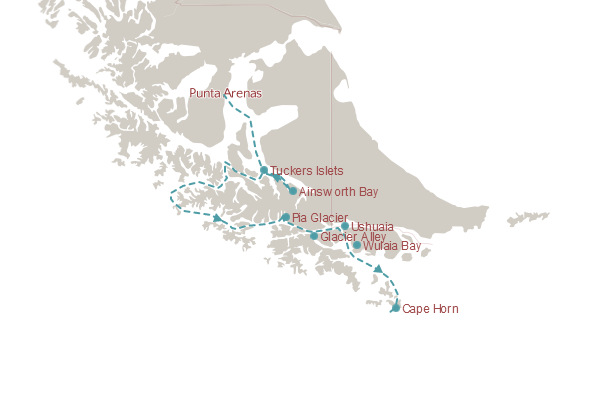 Important: The itinerary on the eight-night Punta Arenas-Ushuaia-Punta Arenas cruise repeats excursions on days four and six (landing on Cape Horn and Wulaia Bay). The excursions described in the itineraries can normally be carried out. Notwithstanding the above, Transportes Marítimos Terra Australis S.A., Transportes Marítimos Via Australis S.A., and Transportes Marítimos Geo Australis S.A reserve the right to reschedule, shorten, or alter all or part of the itineraries and/or excursions without prior notice, in order to safeguard the well-being and safety of passengers, preserve the environment, or due to any extraordinary circumstances, acts of God or force majeure. For the same reasons, the hours of departure or arrival of the vessels may be subject to change. There is no guarantee of wildlife sighting because the precise location of these animals cannot be confirmed.